Historically two best teams of the Indian Premier League (IPL) Mumbai Indians (MI) and Chennai Super Kings (CSK) clash with each other for the first time this season. Both Mumbai and Chennai have won the IPL three times and are in contention for their fourth despite Rohit Sharma-led side registering just one win from three matches. Meanwhile, if you are looking for MI vs CSK free live streaming online and telecast then scroll below for all the details. Mumbai Indians vs Chennai Super Kings Live Cricket Score. Defending champions Super Kings have begun on a superb note and are unbeaten in their first three matches thus far. This will be the second away game of the season for CSK. The MS Dhoni-led side has registered wins against Royal Challengers Bangalore (RCB), Delhi Capitals (DC) and most recent against Rajasthan Royals (RR). Suresh Raina Could Achieve This Milestone During Mumbai Indians vs Chennai Super Kings, IPL 2019 Match. Mumbai Indians, on the other hand, have registered a win against RCB and lost against DC and Kings XI Punjab (KXIP). This will be MI’s second home game. The side is known to start slowly and have won the title in the past despite not doing well in the initial matches. The IPL broadcast rights are with Star Sports Network. So, MI vs CSK IPL 2019 match live telecast will be available on Star Sports 1/HD, Star Sports 1 Hindi/HD. Star Sports Select 1/HD will also provide the live telecast of the match. Apart from these, the MI vs CSK match live broadcast will be provided on Star Sports Bangla, Star Sports Kannada, Star Sports Tamil, and Star Sports Telugu TV channels. MI vs CSK, IPL 2019 Match 15, Key Players: Rohit Sharma to MS Dhoni to Jasprit Bumrah, These Cricketers Are to Watch Out for at Wankhede Stadium. With Star Sports owning the broadcast rights, the live streaming of Mumbai Indians vs Chennai Super Kings IPL 2019 match will be available on Hotstar mobile app and official website. 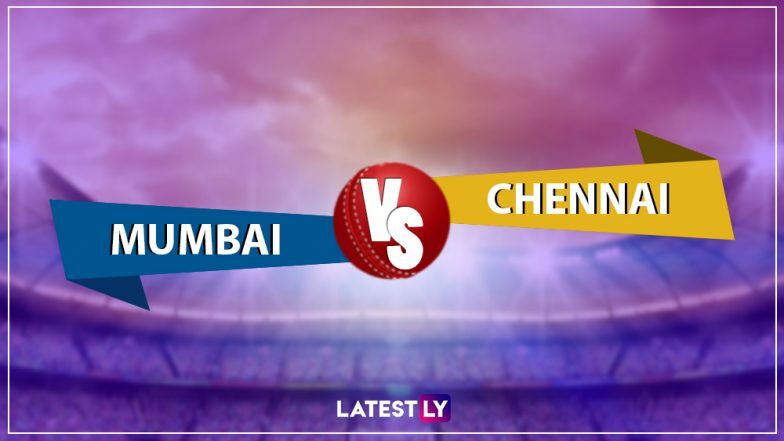 For live score updates MI vs CSK match, fans can follow that here on LatestLY.